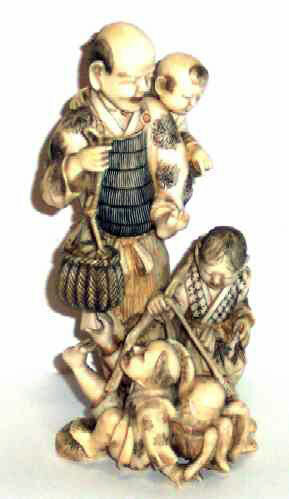 Presented here, a superbly carved Ivory Japanese Family Figural Group of a father and his three sons with their catch of clams in the basket and an active octopus not quite in a second basket. The artistry and nearly incredible detail is the work of a master. Artist signed, circa 1880-1910. 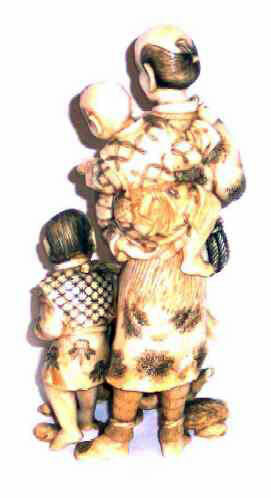 Very Rare quality and charming subject matter makes this outstanding carving a worthy addition to any collection or simply a stand alone piece to be admired.